Big love to artists Favianna Rodriguez, Barbara Kruger, Melanie Cervantes and dignidadrebelde.com, and Nikki McClure for their inspired imagery. Life and change in today’s exact moment in Oakland’s history. If you have an idea you’d like to propose, email a link to your online portfolio or social media presence that represents the work you would create PLUS a quick note telling the curators your intended theme (or text if you’ve gotten that far) and the type of media (i.e. screen print, adobe InDesign, silk screening, hand painted) you’d like to do for the show. APPLY TO BE IN THE SHOW: By 5/18/2016 at 6pm sharp. To keep the show cutting edge and relevant, all artists/designers are encouraged to make new, current work for this show. If you have something already created that you feel is current and is “poster art”, do submit it! FIND OUT: By the end of May 2016: Femme Cartel will notify all applicants. WHERE WILL THIS ART SHOW TAKE PLACE? At the lady-run, super-fresh Naming Gallery, on 15th St in downtown Oakland. HOW DO ART SALES WORK? Artist gets 50% of all work sold, including prints. 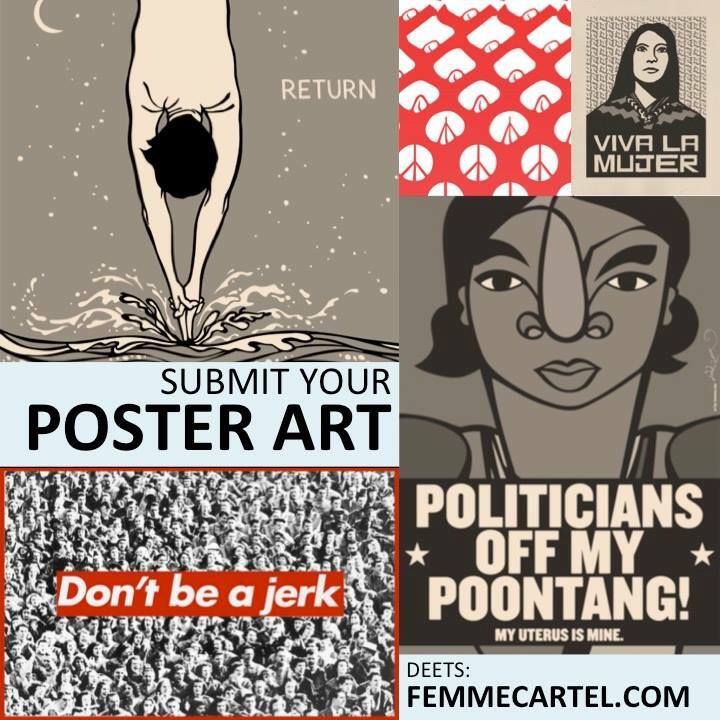 Femme Cartel(.com) curates gorgeous, provocative contemporary art shows, mostly in Oakland and San Francisco, by kickass artists and designers who happen to be female.